Born and educated in Bahawalpur, with a Masters in Mass Communication from Punjab University. Bushra Rehman has written several novels, travelogues, short stories and poetry in Urdu, Punjabi and Saraiki. Her books are instant best sellers and have been translated into many languages. Her columns appear in daily Nawa-e-waqat. 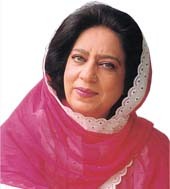 In 2007 she was awarded Sitara-e-Imtiaz for her services to literature of the region. Bushra Rehman joined politics and was elected MPA from Punjab three times, and is the recipient of “Best Parliamentarian” Award. She was elected MNA, and appointed chairperson of Social Welfare and Special Education Standing Committee. In 2008 she was again elected MNA. In 2006 Bushra Rehman was made the Patron of the Masud Khaddarposh Trust. 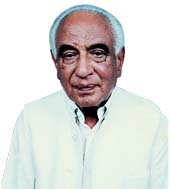 An eminent scholar, social worker and political activist, Malik Meraj Khalid was a close associate of M. Masud, and whole heartily supported his cause and struggle for the promotion of Punjabi language, literature and culture. 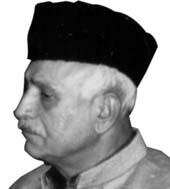 Besides holding the highest political office in the country as Prime Minister, Malik Sahib was also the Speaker of the National Assembly, Chief Minister Punjab, Federal Minister, Rector of the International Islamic University, Islamabad and the Patron in Chief of many educational and social organizations. Malik Meraj Khalid was the Patron from2002 till his death in 2005.